What should you do if you begin to feel drowsy while you're driving? What should you do if you begin to feel drowsy while you're driving? Driving while tired can affect your concentration and reactions enough to make it as bad as driving drunk. If you leave it too long you will eventually fall asleep and have an accident that’s usually worse than if you had been awake because you won’t be able to react. You are driving during your body’s natural sleep cycles (the circadian rhythm, between 3-5pm and 3-7am). As mentioned above, drowsiness gives way to microsleeps which are instances of sleep from a fraction of a second up to several minutes. The longer these microsleeps the more likely you are to run off the road, and in tiredness-related accidents 99% of them involve either running off the road or having a head-on collision. Then you might never wake up. 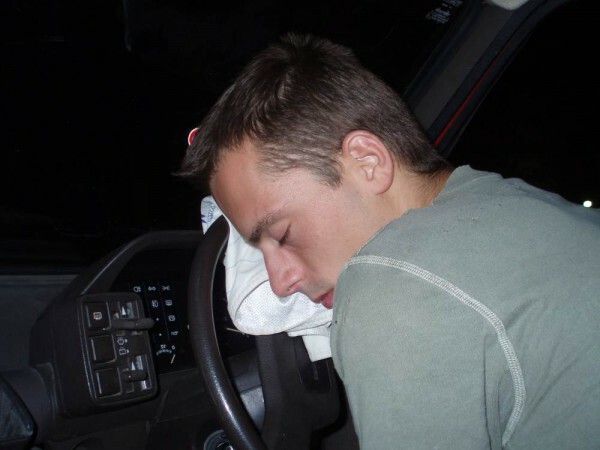 Research has shown that around 20% of crashes are as a result of fatigue or tiredness, and drivers may be prosecuted for negligent or careless driving if they cause an accident through falling asleep. Some over-the-counter medications and quite a few prescription medications – this article gives you more information about driving after taking medicine. Dehydration (which can be exacerbated by eating a lot of protein seeing as the body needs water to digest protein). This article explains the effects of dehydration on driving. Non-medical conditions that cause sleep deprivation such as partying all night, a new baby, staying up studying, etc. 40% of sleep-related accidents are commercial vehicles. There are proportionally fewer sleep-related accidents on motorcycles due to the nature of riding the bike being more physical, louder and less comfortable. What kinds of people are susceptible to fatigue-related crashes? The most at-risk group are men under 30 and people aged 60+. Shift workers are particularly prone if the shifts change all the time. Night-time workers can also be at risk as the body’s natural reaction to darkness is to make you drowsy, even if the person has worked shifts for years. While older people are more susceptible to sleep-related accidents in the afternoon, younger people are more susceptible between 10pm and 6am. This could be because of the hours those two respective age groups are active (e.g. older people are more likely to habitually nap in the afternoon and younger people are more likely to habitually party until early in the morning). The following three might give you several minutes up to half an hour or respite.